Hello! I am so glad you are here to for our Styled for the Season Tour! 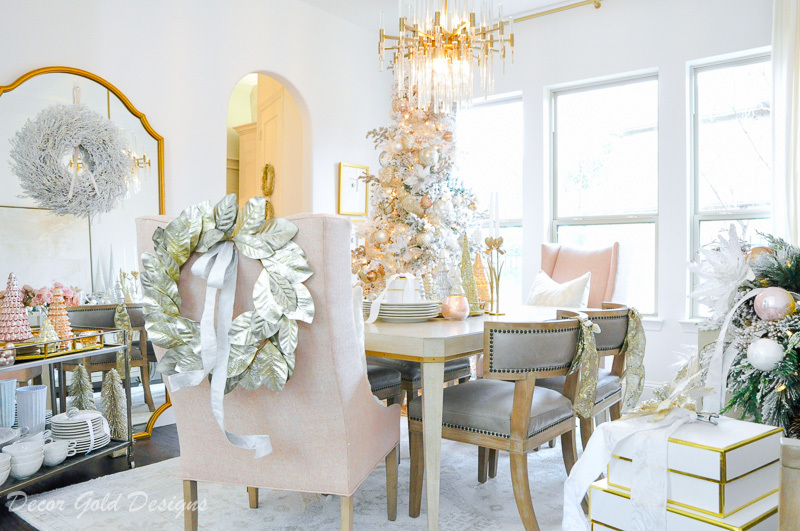 Today I’ll be sharing our Christmas Dining Room! If you are visiting from The House of Silver Lining, welcome! Isn’t Shauna’s brand new modern home stunning? 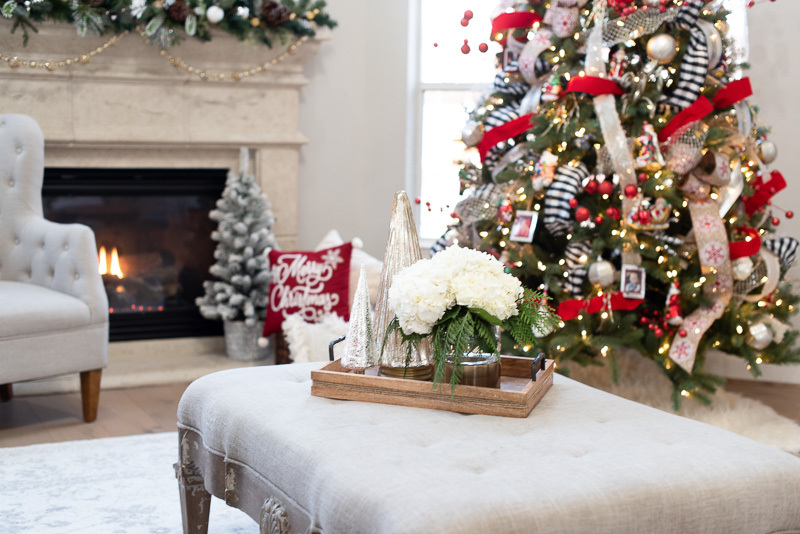 I can’t get enough of her posts, especially now that she’s adding her gorgeous Christmas decor! 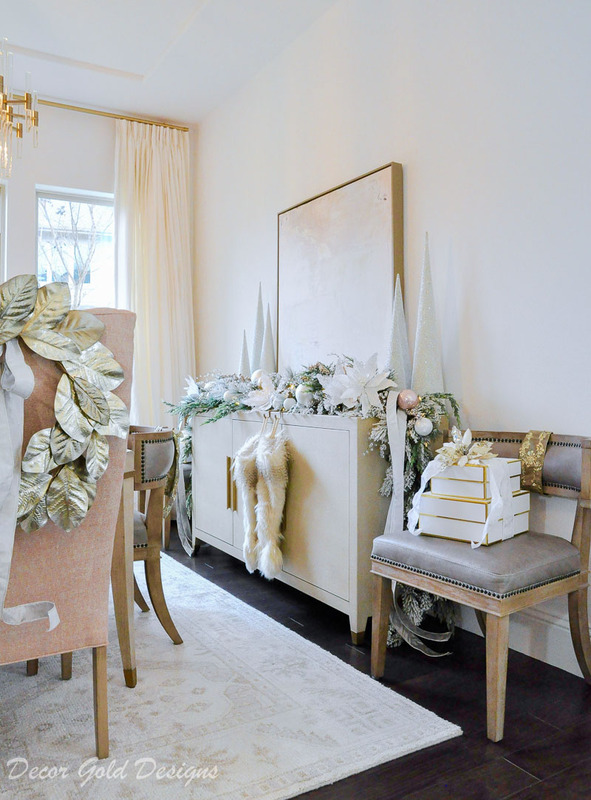 Here at my home in Texas, I have been busy styling each room for the holidays. Ever since I opened my first Christmas box of the season, I’ve been giddy about sharing some of our new spaces all decked out! 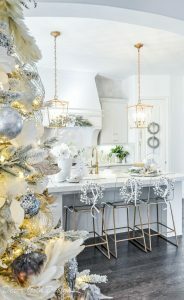 Our Christmas dining room is a space I was thrilled to decorate this year. Just a few weeks ago I completed a full dining room makeover. This was the first time I added Christmas adornments since our dining room was updated, which made it so much fun for me. The space has plenty of room for a slender Christmas tree. Mine is 9′ tall and flocked. 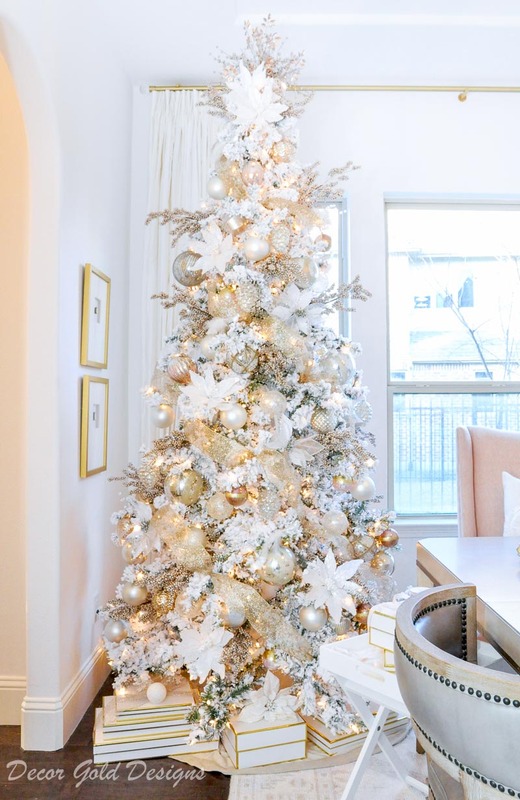 A tall slender tree is such a statement- maker in a room that doesn’t have enough space for a full profile tree. You can step by step details on how I decorated this tree here. 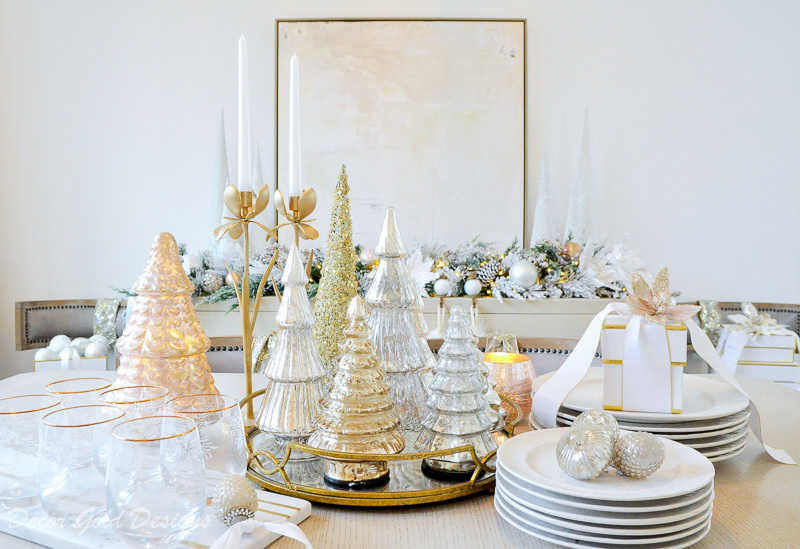 Decorative trees on a tray, dinnerware, and candlesticks can be easily grouped for a collected look on your dining table. 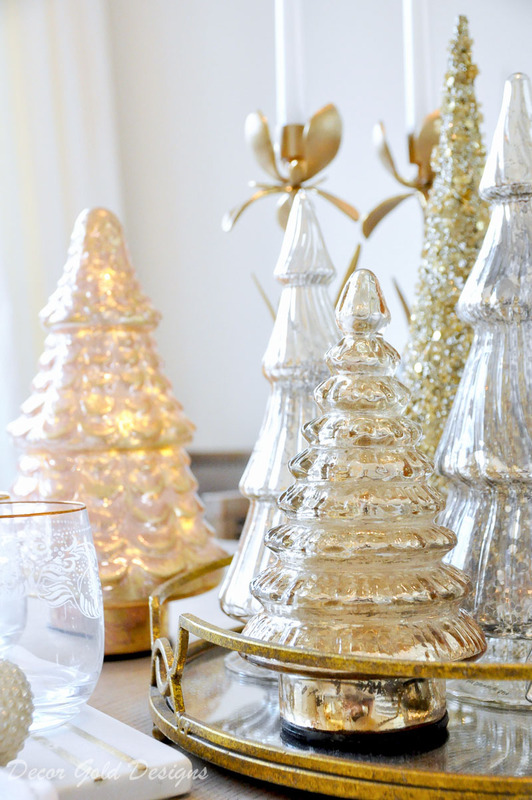 I’ve been collecting mercury glass trees for years, but a couple of new peachy-pink ones and some mini-ornaments add glitz and glam to our bar cart. 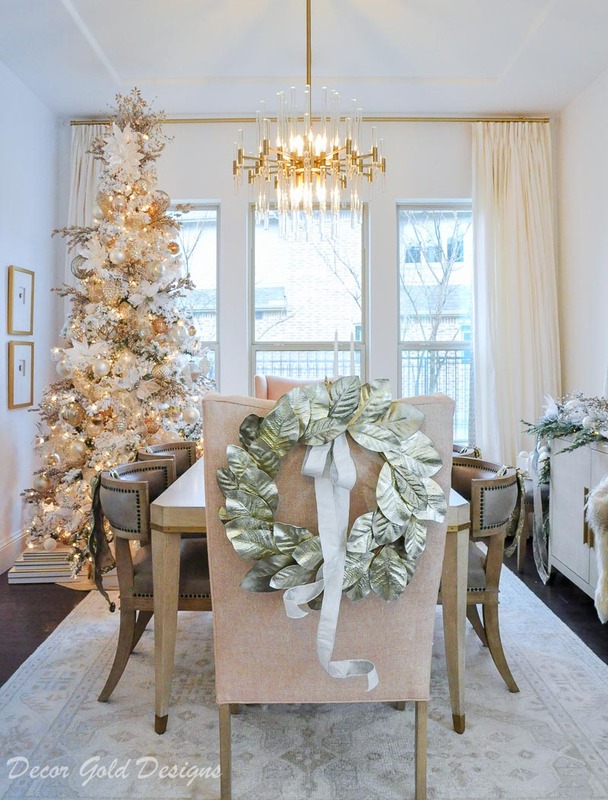 A metallic wreath does the same for our end chairs. I simply added a bit of ribbon to our side chairs. It can be easily fastened with wire. 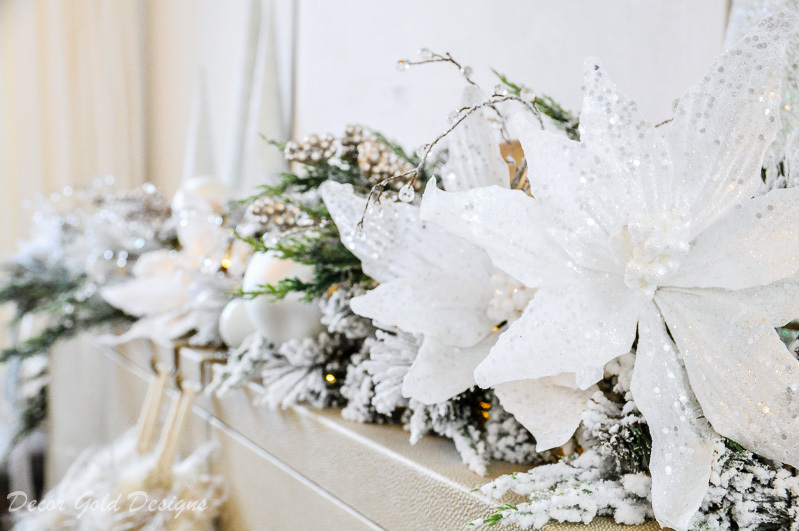 Attach small ornaments, a floral clip, or a miniature wreath for a designer look. Garland on our console was embellished with ornaments and berries. I try to make sure that most of my ornaments and picks coordinate. This allows me to add them to garland, trays, and such where needed. 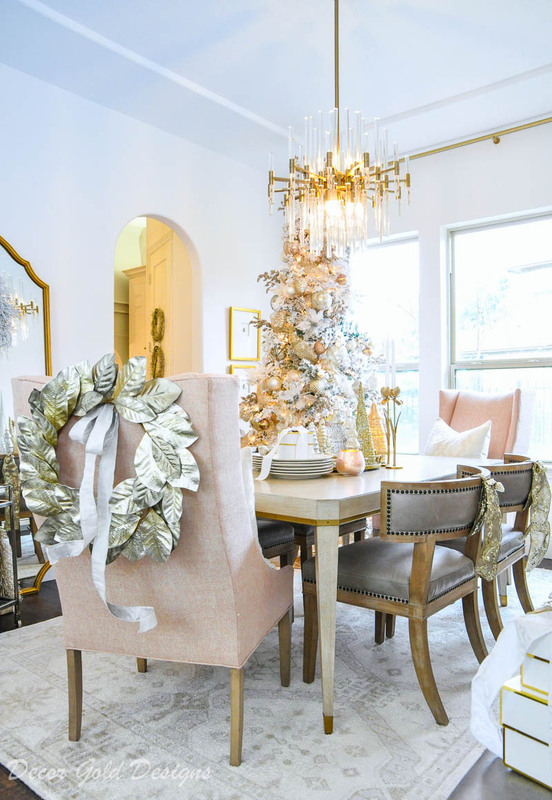 I hope you enjoyed our new dining room wearing it’s Christmas best for the first time! 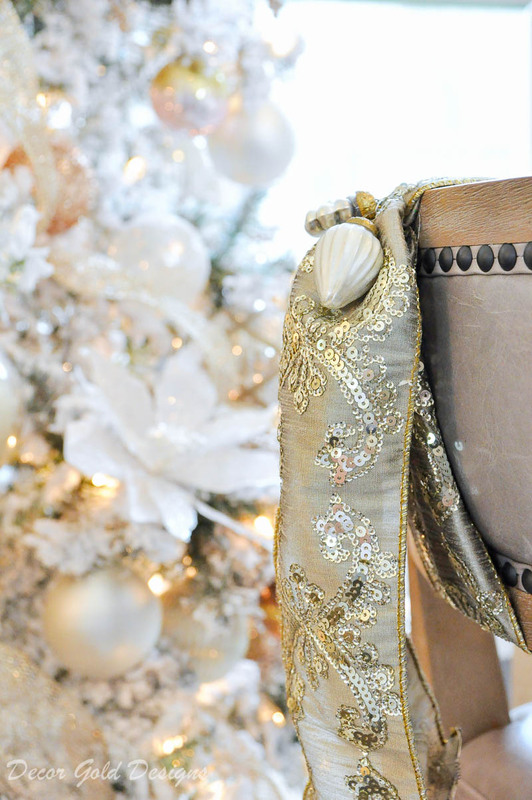 Remember to visit my step by step tree decorating instructions including tips and tricks! I would LOVE for you to subscribe to our newsletter if you’d like notification of upcoming posts including room tours, decorating ideas. Be sure to visit all of the talented bloggers starting with Sara from Haute and Humid! Sara recently renovated her home and it looks amazing! Sara lives near me, so I’ve had the pleasure of meeting her in person. I wish you could meet her too…. she’s such a doll! I have actually met all of the beautiful ladies participating today. I admire each of them. This is such a talented group and you won’t want to miss any of their posts! In case you missed it, I shared my dream Christmas tree earlier this week. 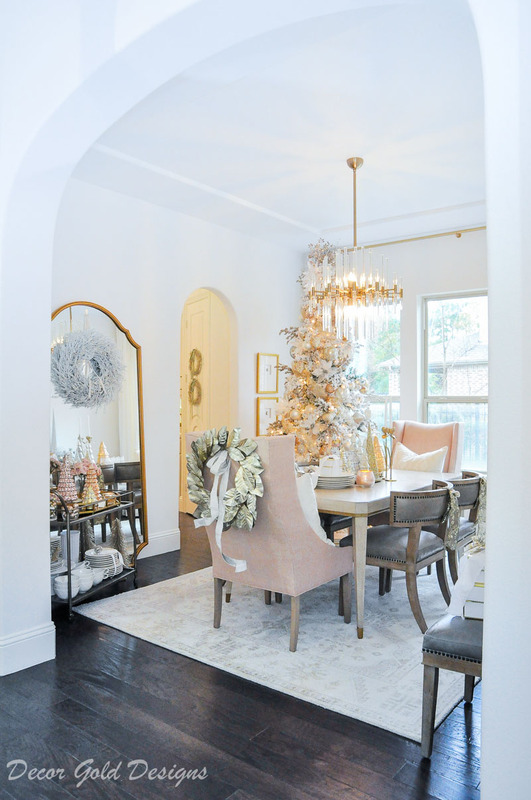 Jen I love your new dining room styled for Christmas! everything looks so stunning! 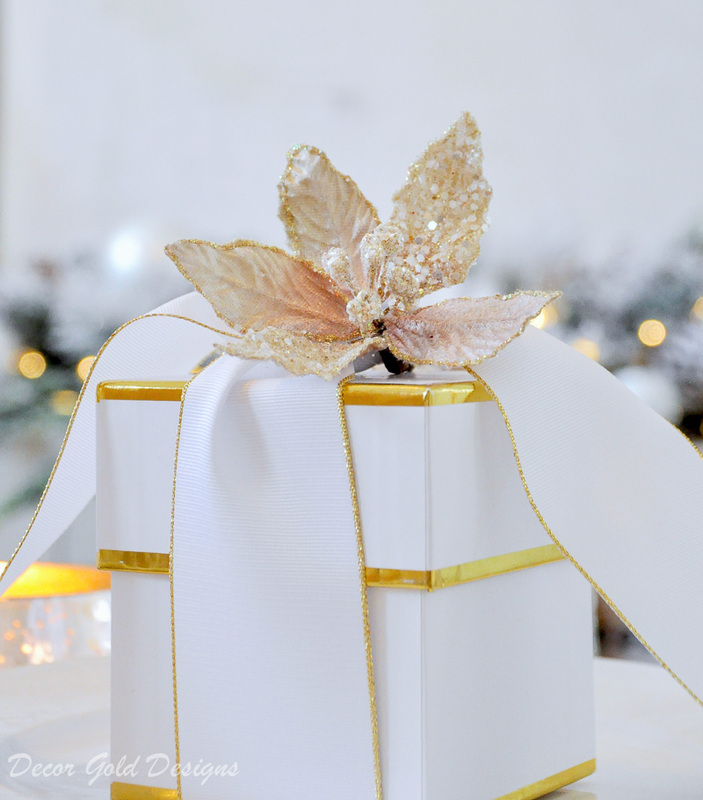 Wishing you many beautiful memories these this holiday season! Such gorgeous gold and silver details, Jen! 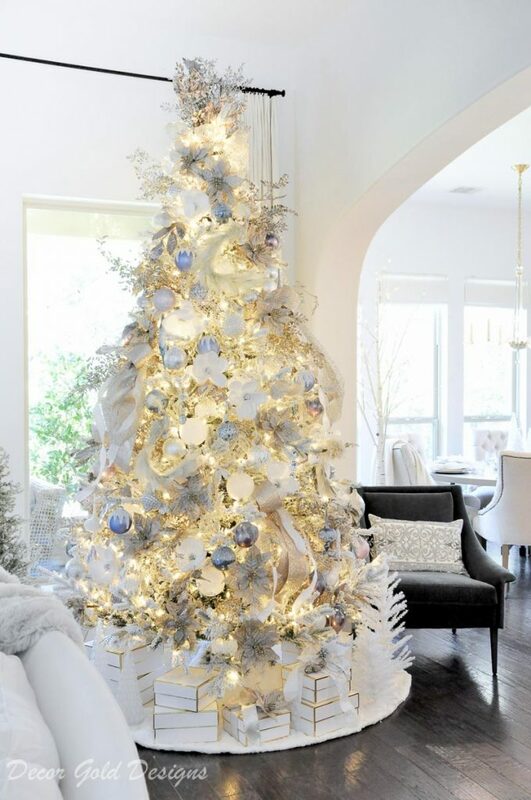 I love the mercury glass Christmas trees especially. Merry Christmas! It’s absolutely GORGEOUS!! 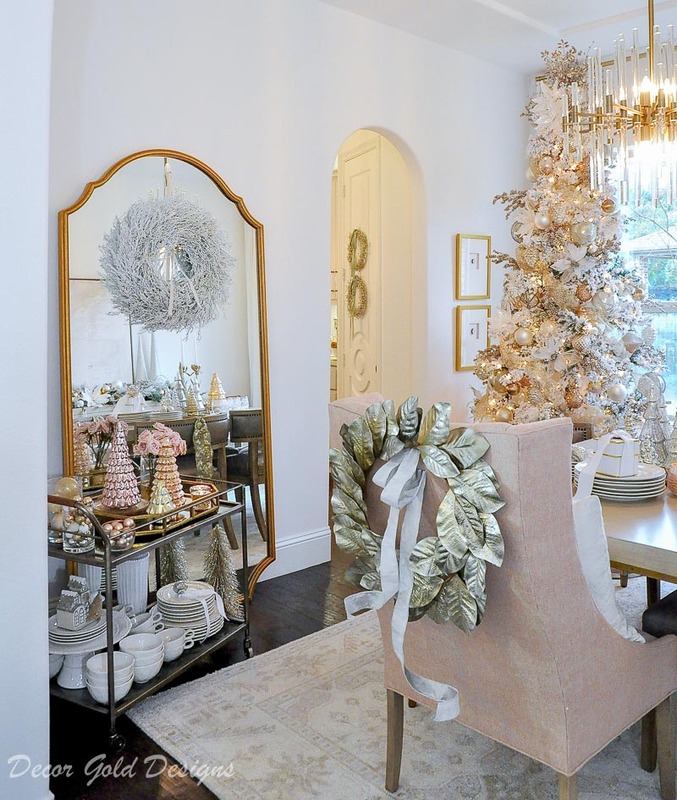 Christmas dinner in here will be so special to your family. Merry Christmas dear friend! Jen, where did you find your white flowers that you have displayed on your coffee table? Also, you have some wreaths in the kitchen hanging on the door, can you tell me where you found those? Everything is just stunning!